Happy Wednesday everyone! Right now J.Crew is having an AMAZING sale!! Most items are 40% and the rest are 30% off!!! Above are some of my favorites from the sale that would make great gifts or outfits to wear for family parties coming up. Such great picks! I haven’t been on the J. Crew website in a while and clearly that is a mistake! I’m really loving the black and white scarf – it would match everything! 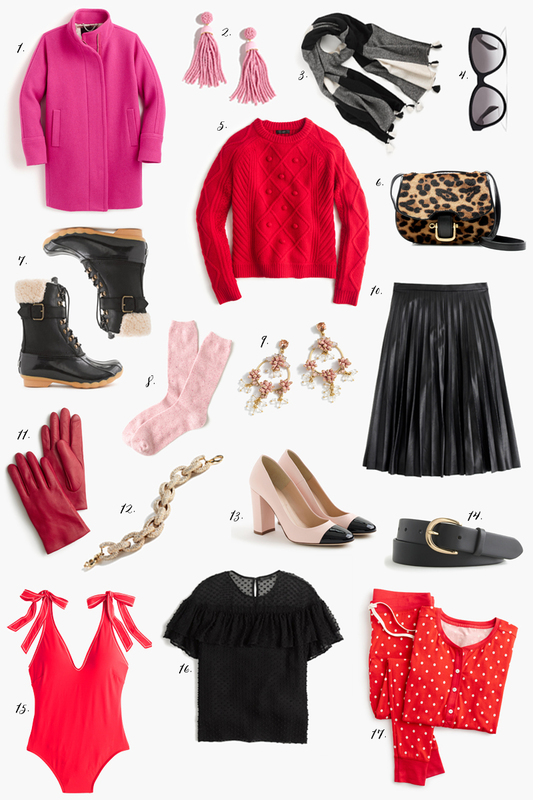 These are awesome picks from the J.Crew sale! My favourite part is they are all so colourful. I love all the items you chose! !I’m going to take look at the sale! J.Crew sales are the absolute best! I always want everything from J.Crew, they have the cutest stuff! Oh I love that red bodysuit! I love all of your picks- especially 1, 4 & 6!! Really great gift ideas in there. love your site, you always have such classy items and look amazing! Did you know your posts aren’t publishing on Bloglovin? I haven’t seen them there in about 2 weeks! Happy holiday and thanks for the giveaway. Find the lulu things to keep different. These are some really great picks Rachel! I love the black top and snow boots the best. I totally missed the post about your favorite lipsticks and holder. Will you please share again you favorite lipstick holder and where it can be purchased. I’m the hunt for a good one! I’d Love to Win this Stunning Bag! It would make my Christmas Very Merry! Love your page I follow you on Instagram, I m a mom to, saludos from Mexico ! !